We're in the middle of the dramatic deer rut season here at Knepp Wildland, with the red deer having just reached their grande finale and the fallow well into the swing of it. The damp autumn air is charged with their primeval roars and belches, and the not entirely unpleasant stench of pheromones. What great timing, then, that BBC's Countryfile team, with presenter Adam Henson, visited us a couple of weeks ago to film the rewilding project and were able to get some lovely footage of red stags battling for supremacy in one of Knepp's laggs, or water meadows. 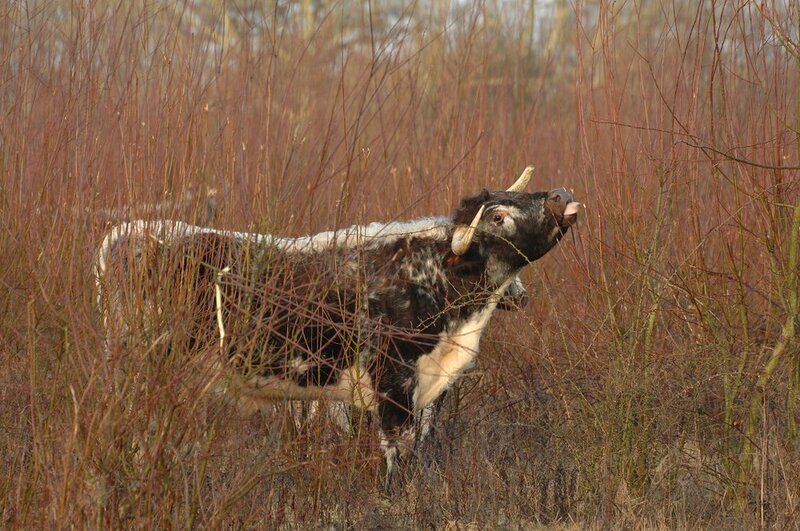 The Countryfile programme is due to be aired on 19th November 2017 - so do tune in to hear Charlie Burrell discussing the rewilding project and how it all began, Isabella Tree talking about our wildlife safaris and engaging the public, our stockman Patrick Toe introducing our longhorn cattle, and Penny Green explaining the wildlife monitoring side of things. The fallow and red deer are important agents in the rewilding project here at Knepp. Along with the our other free-roaming herbivores - Tamworth pigs, Exmoor ponies and Old English longhorn cattle - they are creators of habitat. Their different grazing techniques - the way their mouths work, what they like to eat - has an enormous effect on vegetation. The way they physically disturb the land, too – from trampling and puddling, rolling and rubbing, snapping branches with their antlers and de-barking trees in winter – together with their ability to transfer nutrients and disperse seeds over wide areas, stimulate opportunities for plants and shrubs. Together with the other herbivores, they create an ever-shifting mosaic, a kaleidoscope if you like, of complex habitats - the transient, messy margins in which life thrives. We're not a target-led project like most conservation programmes. We don't have set objectives or particular species that we're aiming to sustain; we simply allow the herbivores free rein and see what comes. The results have been spectacular. Incredibly rare species, like nightingales, turtle doves, Bechstein's bats, lesser-spotted woodpeckers, purple emperor butterflies, and peregrine falcons are now breeding here. More common species are rocketing, too - all of them following in the slipstream of our free-roaming herbivores. Of course, we do manage the project in one crucial respect - the numbers of animals we have here. Too few, and the land would soon revert to species-poor closed canopy woodland; too many and the land would be overgrazed, reducing habitat for other species. It's this constant battle between vegetation succession and animal disturbance that creates the dynamism, and that we seek to maintain with the balance of numbers. So, every year, we cull a certain number of animals to keep herbivore populations in check. This produces a vital source of income for the estate. Our organic, pasture-fed Knepp Wild Range meat is much in demand amongst restaurateurs, food connoisseurs and the health conscious. Animals that have access to an entirely natural diet and are free to choose when, where and what they eat, are not only happier and healthier in themselves, they produce meat and fat that is positively good for humans - a stark contrast to the meat, fats and dairy products produced in intensive systems from animals fed artificially on grain and performance feeds. You can buy Knepp Wild Range meat in our farm shop, which is open until the end of October. It will open again, at the start of our Safari season, at Easter 2018. If you've missed out on this year's Deer Rut Safaris, the 2018 safari calendar is already available for booking on our Knepp Safaris website. Newer PostIs it safe to go in the water?